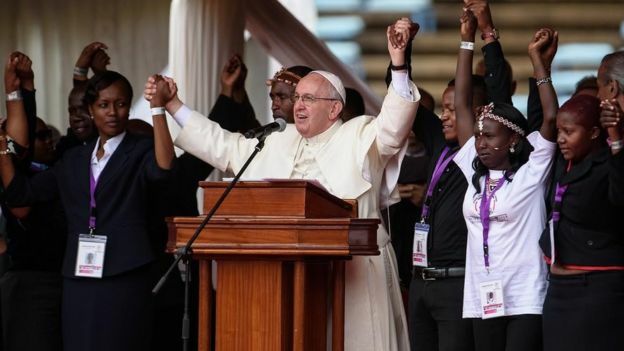 Pope Francis has urged Kenyans to unite and take a stand against the destructive effects of tribalism. During a speech to young people in the Kenyan capital, Nairobi, he got the audience to hold hands to symbolise that they stood together as one nation. 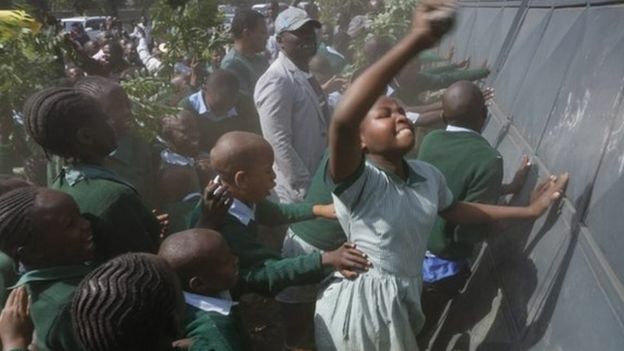 Kenya was shaken by inter-ethnic violence after elections in 2007 in which 1,200 people died. The BBC’s Ruth Nesoba at the Kasarani stadium, where the Pope spoke about issues affecting young people, says the crowd cheered wildly when he condemned corruption and urged them not to accept bribes. Overcoming tribalism would be a daily endeavour that would require Kenyans to listen one another to avoid division, he said. Pope Francis also addressed radicalisation in a country which has suffered several serious attacks by Islamists from the Somalia-based al-Shabab group. 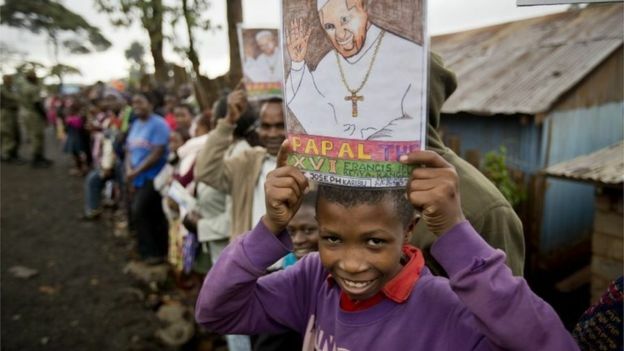 Earlier, the pontiff was cheered as he arrived at his first stop of the day in Kangemi, which is home to tens of thousands of people living in cramped rooms, usually without running water and basic sanitation. He criticised private developers for grabbing land from poor people, referring to an incident earlier this year when police fired tear gas at children protesting against developers trying to take over their playground. He was also critical of wealthy minorities indifferent to the plight of the poor and called for improved living conditions and infrastructure in urban areas – including drinking water and schools. It was a duty for all to ensure that the poor in urban areas had the “three Ls” – access to land, lodging and labour, he said. 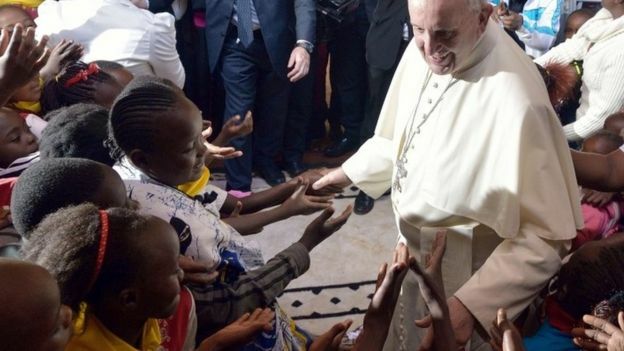 The Pope will go to Uganda later on Friday, before travelling to the Central African Republic (CAR) on Sunday. LRA’s Kony in Central African Republic? Posted on 27th November 2015 by newsafrica. This entry was posted in Africa, Christainity, Religion and tagged Akagera National Park, Bangui, Belgian Shepherd Dog (Malinois), Central African Republic, Duco, Dutch Shepherd Dog, Joseph Kony, Lord's Resistance Army, Rwanda, South Africa. Bookmark the permalink.